Where is the bullying happening here? Allegations of bullying at work can be difficult to respond to in a way that helps to resolve the situation rather than make it worse. A common difficulty for those who are Managers or Human Resources officers is the need to 'prove' that bullying has occurred when someone brings an allegation to them, and the process of investigation and evidence-seeking can be a stressful time for all involved. The person who feels they are being bullied may feel vulnerable and 'under pressure' to come up with evidence that bullying has occurred, while the person who is accused of bullying may feel defensive and want to justify their actions or perhaps feel that they are themselves being 'picked on' through the allegation made about them. It is rare that an investigation process will come to a clear conclusion about allegations of bullying at work, mainly because there can be a lot of subjective perceptions of someone else's behaviour and their reasons for acting as they have. For example, an employee may feel their boss is bullying them by shouting, or dismissing their views in meetings, or ignoring them in the corridor or other behaviours that they find difficult to accept. All of these behaviours have been considered 'bullying' if you research the many definitions of bullying that exist. Meanwhile, the boss may feel under stress and angry that work is not being completed on time and so they shout. They may think that an idea expressed in a meeting doesn't cover all the necessary considerations to be viable and so, in their view, simply disagree with it. They may be too distracted to everyone they pass in the corridor, or may even think the 'us and them' ethos of the workplace they are working in means people wouldn't want to say hello to him/her, so doesn't bother trying. There can be many reasons behind someone's actions that are not intentionally 'bullying' but at the same time may not be conducive to an effective working relationship. None of these interactions make for a pleasant, effective work environment but whether they constitute 'bullying at work' or not will be difficult to decide and prove. And this is the main problem in such situations, the focus on 'proving' bullying has happened. 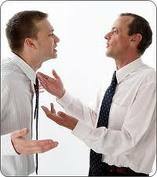 Mediation can help these misunderstandings to be revealed and resolved. Via our online enquiry form if you would like support in resolving issues relating to bullying at work. We can provide Mediation, Conflict Coaching or appropriate training to support staff in dealing with these difficult situations more effectively. At CAOS Conflict Management we have a lot of experience of supporting resolution of such situations through the use of mediation and conflict coaching. We also provide training support to help recognise where such situations can start and how effective communication and effective responses to conflict will mean they don't escalate to become allegations of bullying at work. Our focus as mediators and conflict coaches is on 'What happened and, if it is a problem, how could that be improved for the future?' rather than 'Is it or is it not bullying? When the focus is on giving an opportunity to state what has been the cause of stress and anxiety in a working relationship, and creating a better way of doing things in the future, there is no need to label any participant 'bully' and 'victim' and so the need to prove or defend or justify is set aside, in favour of simply creating a better way of doing things, of listening to how what has happened has been a problem and how it can be improved for the future. 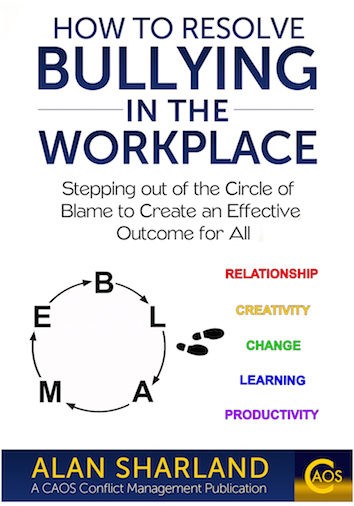 Many consider this to be 'naive' as an approach to bullying at work, but it is very clear that traditional approaches to bullying in the workplace are unsuccessful and we know from direct experience that a focus on constructive discussion has been an effective alternative way of responding to allegations of bullying at work. 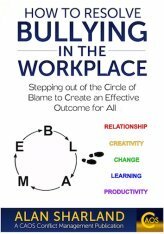 ...if you would like to discuss the ways in which CAOS Conflict Management can support you with your bullying-at-work situation.